My husband and I have been trying to plan a fun movie date night, but with my youngest being sick lately and his crazy work schedule, it makes it nearly impossible to find time to do dinner and movie outside the house. Instead, we have been catching up on shows we have missed, or watching new DVD releases sent to me for review. One title that I have been looking to see was "Who Gets the Dog." But, I knew that when my husband saw the DVD and who was in it, he would say it was another chick flick. Thankfully, though, he is a dog lover like me, and usually is up to watching films with dogs in it. So, we put the girls to bed and snugggled up on the couch to watch this new release, which arrived on stores shelves back on Sept. 27th. "Olive (Alicia Silverstone) is a top doctor with high hopes of starting a family, but her out-of-work husband, Clay (Ryan Kwanten), is too busy concentrating on his dream to be a big league hockey star. On the brink of divorce, the couple can’t agree on who will take custody of their beloved dog, Wesley. Things go from bad to worse as they battle it out in court. Resorting to cheap tactics and dirty tricks, Olive and Clay pull out all the stops to win back Wesley, with hilariously disastrous consequences." Looks like a funny movie, right? Well, it really it. Even my husband in the end agreed that it was worth seeing, and would sit through it again. It has been a while since I saw Alicia Silverstone in a movie, so it was nice to see her back, and in this role, as I know she is a huge animal lover. The two lead characters work well together, and you really get the sense that things would be better if they were apart. But, when you factor in the dog...maybe not. So, how does the movie end you ask? And, do Olive and Clay get back together for the sake of the dog, or drift apart and work out an amicable co-parenting of the dog agreement? 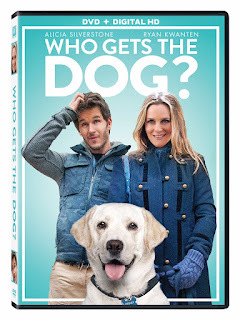 Well, you will just have to pick up a copy of "Who Gets the Dog," available now on DVD. Get ready to laugh and root for the couple and the dog, in this cute film.